Wherefore receive one another, as Christ also hath received you unto the honour of God. For I say that Christ Jesus was minister of the circumcision for the truth of God, to confirm the promises made unto the fathers. But that the Gentiles are to glorify God for his mercy, as it is written: Therefore will I confess to thee, O Lord, among the Gentiles, and will sing to thy name. And again he saith: Rejoice, ye Gentiles, with his people. And again: Praise the Lord, all ye Gentiles; and magnify him, all ye people. And again Isaias saith: There shall be a root of Jesse; and he that shall rise up to rule the Gentiles, in him the Gentiles shall hope. All throughout Advent, we will hear references to Christ's ancestors in the Mass readings. The artistic depiction of Christ's royal genealogical heritage is very old; the West facade of Chartres Cathedral, dated to ca. A.D. 1150, for example, has a lancet window that depicts the "Jesse Tree." Some Jesse Trees depict the 28 generations listed in Matthew -- starting with Jesse and ending in Jesus. Others depict representatives from that genealogy (Jesse, David, Solomon, etc.) 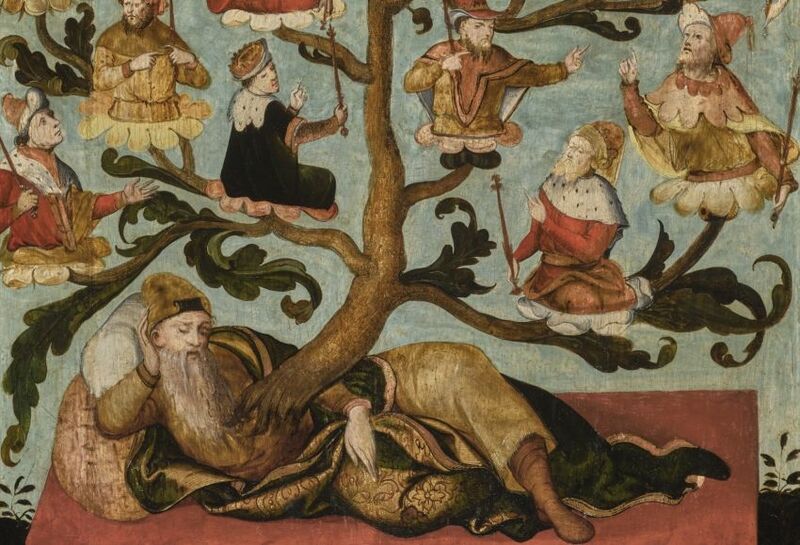 as do most medieval Jesse Trees. Most modern Jesse Trees use symbols which summarize the Old Testament and show, basically, the history of the world up to Christ (Adam and Eve, Noe, Abraham, etc.). A Jesse Tree in the home, then is simply the Advent custom of using a collection of symbols that portray the fact that Jesus has come, as predicted, from the root of Jesse. These symbols can be hung on a small, literal tabletop-sized tree, or on a branch brought in from outside. They can be hung on small artificial trees made of wood or metals, or on two-dimensional wooden trees. The symbolic ornaments -- which can vary from family to family -- can be storebought or homemade -- for example, painted onto wooden rounds, wood carved into shapes, embroidered onto linen rounds which are then sewn onto round hoops to hold their shape, painted on paper, cut out from cardboard, etc. Gorgeous paintings and graphics could be scanned, printed out, and glued onto wood and shellacked. Or they can be made, like Christmas Tree ornaments, out of "Baker's Clay." Some families add ornaments to their Jesse Trees one each day, starting on 1 December to time with the Advent Calendar and O Antiphons (24 ornaments); others add them all at once on 1 December. Some make Jesse trees that stress prophecy, with symbols of the Old Testament Prophets and the Sibyls; others makes ones that stress the history of the world from creation. Whatever works for your family is fine, but whatever you do, and whatever symbols you use, the point should be to show that Christ springs from the root of Jesse, per Isaias's prophecy, and with the Infant Christ being held by Mary at the apex. Note: I've seen some pre-fab Jesse Tree Kits that use a so-called "Star of David" (also called "Magen David" or "Shield of David") as a symbol. The "Star of David" -- which wasn't a popular symbol of Jewry until the 18th c. when it was adopted by the Rothschilds (though it was known before then in post-Temple Judaism and is found in a few synagogue decorations) -- is actually a hexagram with 6 points, 6 equilateral triangles, forming a 6-sided hexagon interiorly. It is the ancient star of Remphan (Moloch , Chiun, or Saturn) and Ashtoreth mentioned in Amos 5:26 and Acts 7, and one of the most powerful symbols used in Freemasonry, Satanism, and the occult. For a true symbol of David, use a harp or a crown; for Solomon, use a temple or a crown. The tomb of Jesse and Ruth can be visited in the Tel Rumeida section of Hebron, about 19 miles outside of Jerusalem.